Nearly half of all patients admitted to critical care units (CCUs) are 65 years or older. These patients require complex medication management and treatment protocols, which generate vast amounts of data in the EHR. MEDITECH’s Critical Care solution is designed for the workflow of this high acuity environment, incorporating metrics in a meaningful way so they can be used to drive clinical decisions based on the right data, at the right time. Monitoring and analyzing both historical and real-time trends, then initiating best practice treatment protocols sooner for optimal outcomes. Because Critical Care is a component of MEDITECH's Expanse EHR, data from each care setting is available to clinicians along the entire continuum traveled by the patient. The Critical Care Flowsheet serves as a touchstone for coordination between nurses and physicians, since all data tracked via the flowsheet becomes part of the patient record. By enabling more multidisciplinary collaboration, MEDITECH’s critical care functionality paves the way for smoother transitions and better patient outcomes. MEDITECH’s Critical Care solution provides nurses with easy access to review and act on both system-generated data and external patient monitor data, all from within an intuitive workflow. This design increases nurse efficiency by improving the timeliness of care and enhancing clinical decision making. Developed and refined with practicing critical care specialists, MEDITECH’s solution is a context-specific tool tailored to the unique critical care environment. The power of the integrated Expanse EHR enables clinicians to “live in the flowsheet,” as all of the data they need to act upon, and all of the data they collect, is brought together through a single user interface—enabling providers to streamline their workflow, detect trends, and make informed, timely decisions. 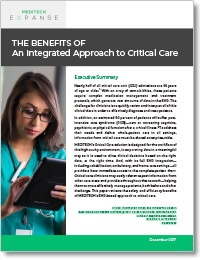 Download this white paper to learn more about MEDITECH’s Critical Care solution.